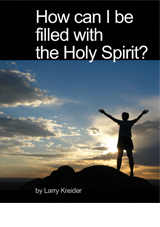 House to House Publications » How Can I Be Filled With The Holy Spirit? Home / Basic Christian Resources / How Can I Be Filled With The Holy Spirit? This booklet takes the mystery out of what it means to be filled with the Holy Spirit. Discover what the Bible says about this experience. Use it to clarify who the Holy Spirit is and how His power can be released in your life. Check out another easy-to-share booklet: What Does It Mean to Be A Real Christian?